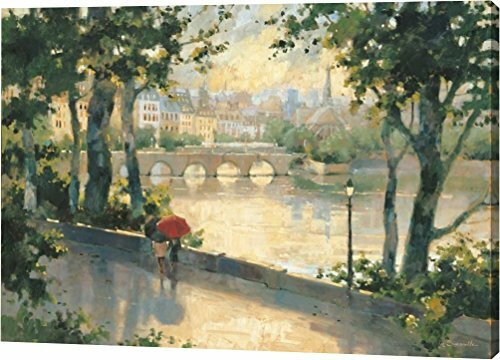 This 22"x32" premium giclee canvas art print of Paris Evening by Marilyn Simandle is created on the finest quality artist-grade canvas, utilizing premier fade-resistant archival inks that ensure vibrant lasting colors for years to come. Every detail of the artwork is reproduced to museum quality specifications by our talented graphic artists. This magnificent canvas print is gallery wrapped by one of our professional framers on 1.5 inch deep wooden stretcher bars. The gallery wrap process allows you to hang the artwork on your wall frameless, since the printed border is wrapped around all four edges. Your gallery wrapped canvas print will arrive to your door ready to hang with all necessary hanging hardware. Canvas Art USA brings your walls to life with our meticulous attention to detail, all backed by the best customer service in the biz. If you have any questions about this product by Canvas Art USA, contact us by completing and submitting the form below. If you are looking for a specif part number, please include it with your message.